The first time I walked into an animation studio, (and this wasn't the 30s, the 50s or even the 70s), I was met by wolf whistles, howls and loud catcalls. Yikes. I quickly checked but no, I wasn’t wearing my high-cut hot pants, low-cut spangly top or translucent platform shoes and my rhinestone-studded thong wasn’t showing either. Heck, my hair wasn't even blond that day. I wore jeans and a baggy white T-shirt, the animator’s uniform; in one hand I proudly clutched my film (produced, written, designed and directed by me) and in the other, my art portfolio. My appointment was with the head of the studio, who'd heard all this ruckus when he came out to greet me. I looked at him, expecting at least a frown at this behavior, but no, he just smiled and chortled at his unruly boys, smoothed his hair and showed me into his office. “What can I do for you, honey?” he asked, his toothy smile unfolding above his splayed collar and gold necklace. Had I taken a wrong turn down the career rabbit hole? I thought the interview was an aberration, little did I know it was a harbinger of things to come. I just wanted to animate, to make people laugh and cry with my pencil, not to spend my time being harassed and patronised. BRENDA CHAPMAN fired from Pixar's "Brave"
When I get a bit stuck writing, I turn to Twitter or Super Gem Drop for distraction. When I stay stuck, I turn to art. I get out the Pelikan watercolors and a glass of water and I slosh some paint around. Usually on paper, but sometimes, on glass. During our recent rainy spell, I painted my dining room window and my writing room window with leaves. It’s best to do this on a rainy day, since it’s hard to paint with the sun in your eyes or even against the light. No design or preparation necessary (except maybe to wash the windows), just paint a twisty stem from sill to pelmet, then add curly branches and swirling heart-shaped leaves as you go. It's easy and very mentally relaxing. The exact mixture of paint to water took a while to get right. Too much paint and the leaves look thick and muddy, too much water and the paint runs all the way down the window. It needs to be pale and translucent so the sun can shine through it, yet still make clear leafy shadows on the table and carpet. The secret to the perfect consistency: add a drop of Soft-Scrub. This also makes it easier to wash it all off when you get tired of it. While you paint, run your writing problems through your head. And while you're at it, run any other problems through your head as well. I find that the distraction of the painting, permits my brain to function more clearly. The higher panes were a tad hard on the back and the wrist, but it was wonderfully distracting and rewarding. By the time I'd finished painting, the book’s plot problems were solved, in my head at least and I felt like writing again. Best of all, I can enjoy the leaves every day; in the morning they're dark against the sky and at noon they glow white when the sun shines through them and casts lovely leafy shadows on the furniture and across the floor. It's like living in a summerhouse in the winter. Ideally, you don’t want to escape from a cinema. You want to leave it reluctantly, thoughtfully or happily humming something. However, after two and a half hours of AVATAR, it was a relief to be outside where the colors suddenly looked too red and yellow, where everything was sharp and focused and fire-engines screaming down Sunset Boulevard seemed more exotic and thrilling than the movie. And my eyes could stretch all the way to the end of the street and all the way up to the sky instead of being strained and constrained by goggles and layers of glassy 3-D. While AVATAR’s design was stunning, the lighting stupendous, the 3-D effects suitably flinchable, I had to flee before the end, because I just didn’t care what happened to the hero or the numb-faced, big-eyed blue people, I just wanted to get out of there. I couldn’t take anymore thundering sound, eye-crossing 3-D effects, nose-crushing goggles, or hackneyed halfwit dialogue. All the twelve year-old boys in the world may go and see this movie twenty times, but it still has no heart, it can't move you beyond a gasp. And that, finally, is my point. Writing for such intricate, carefully wrought digital and even hand-drawn films must catch up to the splendor of the art which is light years ahead of the scripts. AVATAR may be in 3-D but the characters aren’t. We don't care about them, how can we, they’re so 1-D, so wooden and predictable. They have none of the things we identify with: fears, flaws, foibles, suffering, struggle, transformation, comeuppance. Violence and beauty alone don't make a story or a character interesting. The same effort and knowledge that go into the graphics, must go into the writing of a MOCAP film. A digital character must have at least as many layers of personality as the images do, if not more. I’m tired of seeing fabulous CGI art with terrible dialogue and boring, sappy stories. Keep up screenwriters, wake up producers: there are more than twelve-year-old boys in your potential audience. CGI art is no longer restricted to children. It’s a glorious, versatile medium that can express all emotions, represent all situations. It has everything live-action has: technology, lighting, camera angles, technique and the many talents of digital designers. Studios, you can rake in just as many millions if you use digital artists’ talents for more than just blasting eardrums and eyeballs . Screenwriters, be adventurous, write for a medium that has surpassed its childish limitations. Write some fresh, new, thoughtful scripts for MoCap, with nuance, subtlety, emotion, plot and depth. Stars, demand better scripts to lend your voice to. Digital animation is not just for cuddly fish and talking animals anymore. Imagine what MoCapped actors could do with real dialogue instead of juvenile tough talk and sentimental pap. If artists and film-makers can provide such dazzling multi-layered images, whether hand-drawn, CGI, rotoscoped or motion captured, why not let writers do as much with the words? The author of this week’s post: research scientist, physicist and looker extraordinaire, Ian Hopkinson, Ph.D, who works in the UK. My background is in science and recently I've been working on the science of appearance. The science of computer graphics forms a part of the appearance science area. There's a lot of science that goes into computer animation and movie special effects. One part of the problem comes down to making a model of light and it's interaction with the world, including difficult materials like hair, fabric and skin. More directly involved in the animation process is the question of how to help the artist bring a character to life: given a character in one pose, how do I get it to walk, to run, to jump with the minimum, easiest intervention from the artist? How do I make it as intuitive as possible for an artist to get the effect they want? In this area my main interest has been in the first of these areas: a model of light. My desire is for this to be physically correct, rather than artistically appropriate. So if you wish to put your character in a pool of light, to my mind that pool of light must obey physical laws, it must be made by a physical light fitting that you could make in the real world, it must cast shadows and it must be reflected appropriately into the rest of the scene. Modern computer graphics software has many knobs for the artist to turn in order to get the effect they want, but these knobs don't have to obey a physical world. Lights can be made that can cast dark, lights can be made that only illuminate some objects in a scene. Similar problems occur in the physical description of materials. To me this is terribly wrong! The computer scientists interested in new algorithms for the modelling of light aren't generally artistically inclined, so rather than creating new and interesting computer models each time they wish to try out a new algorithm for representing a material or modelling light they turn to a limited number of old favourites, such as the Utah teapot, the Stanford Bunny or the Happy Buddha. Learn these objects and you will be able to nod knowingly the next time you see them. In some ways computer art packages are a new sort of tool (like a brush for a painter, or a chisel for a sculptor) but their controls are an abstraction. When a painter paints, they must use physical objects in the real world to create their effect. A brush may be designed to give a particular effect, but it is constrained by what the physical world can do. By looking at a brush you can get some idea of what effect it will have, and what you might have to do with it to get different effects. Computer software, on the other hand, is different: the designer of the program must chose how to link user input to on-screen effect. The physics department I worked in had an artist in residence for a while, we respected her because she'd written a successful grant application to join us. It was very illuminating talking to her, because whilst we both had the same interest in how things looked I wanted to know what something really was whilst she was more interested in what range of things it could mean. This could lead to some frustration, I remember clearly her bringing a beautiful photo to lunch which could have been a galaxy, or it could have been a pattern of powder on the surface of a bucket of water, or it could have something else - the frustrating thing was she wouldn't tell me which it was! I did some "research" for this post: I watched "Simpsons the Movie" and "The Incredibles". I enjoyed them both, and for broadly the same reasons: They are cartoonish in their content (impossible, exaggerated, colourful), and they have a sense humour. From a technical point of view, the lighting in "The Incredibles" is beautiful, and the rich characterisation of real-ish human figures is impressive too. However, in the end, the technical means by which they come to be on the screen is less important than the story, even for someone with an interest in the area. Looking is so simple and satisfying, it's surprising that more people don't do it. For a writer or an artist, it’s second nature. At least it should be. What can you write about or paint if you don’t look at what’s around you? Even fantasy requires some carefully-observed characters for the reader to identify with. As a child, I was lucky enough to have a terrific teacher who told us to choose one square foot of garden, observe it for ten minutes, then write about it. I was amazed and thrilled by what I saw and I think that’s what taught me to look properly. Much later, a so-called creative writing teacher once told us NOT to write what we know and see, but to make it all up. She didn’t, her books were well-observed fiction and I couldn't help wondering if she was trying to subvert any writers in the class, eliminate the competition. Recently a friend, an aspiring writer, claimed she couldn’t write about exciting things, because she didn’t lead an exciting life. Aarg. A writer can make anything exciting, from a grain of rice to a pile of laundry. Taking a moment to examine something, inspect its structure, its color, its shape, its function and consider its role in the grand scheme of things, is fun and far more exciting than anything I could make up. Proust thought so too. I remember holding a human femur in anatomy class in Paris and marveling at the intricacies of the bone: not merely a skeletal support, but engineered to be stronger by its slightly twisted and faceted shape, it had indentations and holes for blood vessels and nerves, grooves for muscle attachments, a smooth, rounded end to fit into a pelvis and condyls at the knee-end to fit into a tibia. 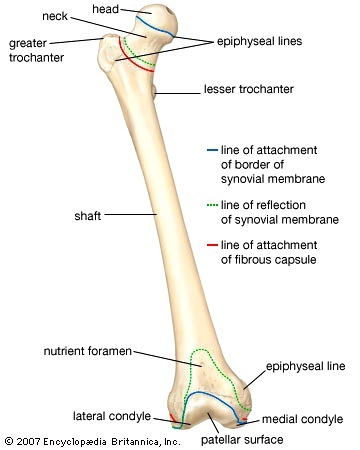 A femur is such a long, swooping, graceful bone, it amazed me to think that all that articulation and support works at an angle too, when we walk with such thoughtless ease. I also wondered about the human being who used to move through the world with that magnificent bone and how oddly intimate and rather rude it was to be holding his femur. Few people really look closely at anything and most, when you enthusiastically ask them to “Look at this!” just give the item a cursory glance and smile politely. Very few stop and actually examine your find. So the responsibility falls on artists and writers to observe, then put what they've seen into paint or words so others can see what exciting stuff they missed. I once worked with an artist who knew how to look. When I'd rush in with great excitement about something, he would actually stop what he was doing, pick up what I'd brought, turn it over, scrutinize and pore over it and point out additional things that I hadn't yet noticed, adding to the thrill of discovery. So satisfying to look at something together, four eyes are better than two.